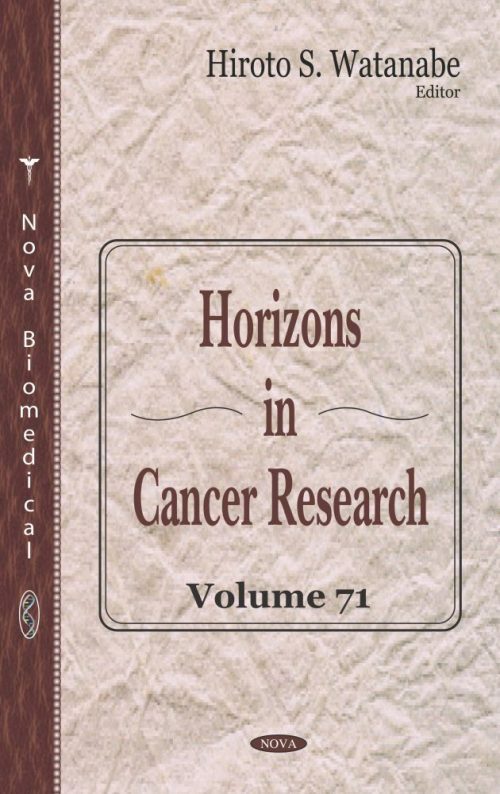 Horizons in Cancer Research. Volume 71 begins by reviewing the histopathological features of head and neck squamous cell carcinoma and its precursor lesions, risk factors for head and neck squamous cell carcinoma including viral infection, chemical carcinogenic and ethnic predisposition. New knowledge about major pathways and signaling is also presented. Next, the clinical development of PD-1 and PD-L1 inhibitors in head and neck squamous cell carcinoma to date is reviewed with a focus on phase I-III clinical trials. The authors also discuss future considerations and strategies to optimize the benefits of this class of immunotherapeutic agents. Glioblastoma multiforme, the most deadly primary brain tumor in adults, is studied in the following chapter. Various studies show that only 3‒5% of glioblastoma patients survive longer than 3 years and nearly 100% of all tumors recur due to therapy resistance. The most challenging aspect in the treatment of glioblastomas is the invasive nature of the tumor cells to the surrounding brain tissue. Current forms of treatment for glioblastoma allow for short-term survival, reflecting an urgent need for the development of a new form of treatment. The authors also present the cellular and molecular mechanisms of glioblastoma underlying the evasion of treatment, rationale for using novel therapeutics currently undergoing clinical trials, and explore promising molecular targets for the development of future therapeutics. This collection goes on to demonstrate the importance of TNF-alpha and its receptors in malignant gynecological and breast neoplasms, the immunological mechanisms in these neoplasms, and the role as possible future targets in the treatment. Information about the mechanisms of c-Myc are presented in order to update previous studies to discuss some of the current paradigms and provide a basis for future studies. c-Myc is a regulator gene that codes for a transcription factor, and it is important for many multidirectional cellular functions. In one study, the structural, energetic, spectroscopic and electronic properties of organometallic Ru(II) complexes of the general formula [(η6-arene)Ru(XY)Cl]Z (XY is N,N-(diamine), N,O- or O,O cheating ligands, Z = PF6 anion) were calculated by means of density functional theory electronic structure calculations. These complexes, adopting a “piano-stool” geometry, are potent anticancer agents and their anticancer activity against various types of cancers has already been investigated. In the closing contribution, the authors outline the guidelines for sentinel lymph node biopsy in the management of thin melanoma on the basis of its histogenetic features. A histogenetic conception and an uncertain malignant potential appear to be the most significant discriminants on whether or not to perform the biopsy. Chapter 6. What Is the Role and Underlying Mechanisms of c-Myc in Breast Cancer?